If you’re like me, you have a tough time getting your 8 glasses of water every day. And if you are like me, then why not join in on Project Hydrate to work on getting those very important fluids in. Project Hydrate is a little challenge I put together to try to get myself to drink 8 cups of water every day for the rest of the month of March, starting Monday, March 8, 2010. I typically barely get 4-6 cups of water a day, but I know I should drink more. I like reusable, non-BPA, aluminum bottles. They’re so much more eco-friendly than throw-away bottles of water. I got this fabulous water bottle for Christmas. 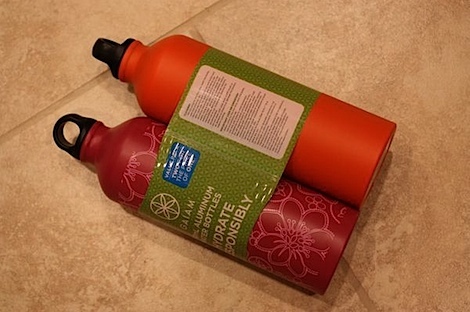 I found these aluminum water bottles at Target today – 2 for the price of one ($12.99). I plan to use water bottles to help me gauge how much water I’m drinking. If I bring 2 water bottles with the total amount of water I need for the day, then I know I just need to drink the water from those bottles by the end of the day. Since I work at an office all day and I’m a germiphobe, I prefer to take my water with me during the weekdays. I’m planning to use eco-friendly water bottles, instead of standard bottled water. I’ll try to space out my water intake over the course of the day. It’s not safe to consume too much water at one time and your body will be better hydrated if you pace yourself. I get cold at the office, so I’m planning to make hot tea part of my daily water intake. I’m planning to drink extra water for fitness activities. I don’t typically drink much other than water, tea, and coffee, so I’m not really focused on drinks outside of those categories. If I drank them, I wouldn’t count sodas as part of my intake, though. Bring 2 reusable water bottles full of water to work – each of mine hold about 3 cups. NOTE: Athletes have different requirements for proper hydration, which depend on the type of exercise and of course you. This challenge is for every day water consumption. You may want to research your activity to learn the best way to stay hydrated for your physical activity. Anyone interested in joining me for Project Hydrate? Leave me a comment or email me at thechiclife at gmail dot com and I’ll add your name (and link back to your blog if you have one). Megan @ Great Food, Hockey and Health! Have you blogged about your experience with Project Hydrate? Lessons learned? Changes noticed? Etc.? Email me at thechiclife at gmail dot com or leave me a comment and I’ll link to your post. NOTE: Please join in on Project Hydrate at your own risk. It is possible to consume too much water (though I’ve heard this isn’t typically applicable for the everyday person), so please be responsible. Also, Project Hydrate doesn’t take into account athletic activities. Athletes generally require more water than the normal 8 cups a day, depending on activity. Please consult your doctor before trying any new diet or lifestyle change or to learn about the appropriate amount of water intake for your personal needs. I’m in! I’ve always been a pop (soda) girl and I know I am so dehydrated. Lately I’ve been cutting back on the pop and trying to drink more water. This is a great idea and I’m excited about it! Thanks! Count me in too!! I just bought a 1 Liter water bottle that I am planning to fill at least twice daily!! Count me in. 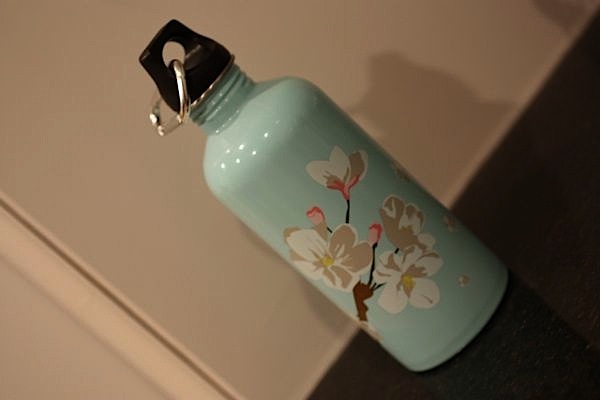 I got a beautiful Sigg water bottle for my birthday last month so I will enjoy any excuse to show it off in pictures! Any other girlies find it harder to hydrate at certain times of them month? Maybe I’m just odd! I think water is the most important thing. Your body is made up of mostly water and needs to stay hydrated. Great! I totally notice when I haven’t drank enough water that day, I feel more snacky and less focused….and then I remember crap, I haven’t been drinking water! great post. Nope, I am just out of it haha and spelled the URL wrong…. Great post! This is definitely something that can often be neglected even by the health-conscious. I’m on a medication that makes me dehydrated, and I definitely need more than 8 cups a day to stay sated. So I’m always reminding (some might call it nagging) people to drink more water! 😉 Good luck! I am in! I am all for hydration, and I love the environmentally-conscious tilt. Great ideas! Oooh! Count me in, too. 🙂 I grabbed a few of those 2/1 Gaiam bottles at Target last week. Love them! Hope you’re having a good day. I’m ready for Project Hydrate. I finally found my missing water bottle, at work. I’m also going to incorporate Green Tea into this challenge, to get my water intake. i used to drink 3-4 litres of water a day when i was in college..but ever since I started working, i find it difficult to even manage two…this is just the kind of thing i need right now!! And here’s a tip that might help, coffee and non-herbal teas are essentially de-hydrating, so for every cup of tea/coffee you have add another glass of water. Oh and lukewarm water is the best! I am bad. I barely drink 8 glasses of anything during the day. Maybe a bit of water, coffee, tea at night, ocassionally soda or Crystal Light. My dehydrated self needs to join Project Hydrate. I want to play!! I love the idea of the two bottles, too. I’m game. My water intake has been lacking and it’s been on my mind. Great idea! Especially with the warmer weather and outside running.. I’ll need it! I gave up pop for Lent but I am hoping to make it a true lifestyle change. I already drink at least one SIGG water bottle per day but I will attempt to up it to two. I also plan to drink water with my meals. I will limit my caffeine to one coffee in the am (been doing that since “giving up” my Starbucks run back in Jan/Feb) and one tea in the pm (before 6:00 pm). Count me in for project hydrate! I started this on my own last week anyway. Oh, and I got my SLR strap. It’s awesome! Thank you!! Yay! Glad you got it ok and like it! 🙂 Thanks for joining the challenge! I am in-what a great idea! I am SO in. I really need to up my h2o intake! I really don’t work at this so I will join! I have very low BP and my dr. said to increase the water. Last visit I was at 80/50! I posted about the challenge this morning on my blog! I am so in for this! Why is it so hard to get a lot of water in when I know it makes me feel better? Agh. This is a great idea! You already get enough water via other sources — food, etc. I find that when I walk a lot, or when I am a tourist, I need a litre or two a day just to keep up… and it seems to evaporate right out of my skin. When I drink too much water, it flushes my system too much and I go to the washroom too much — that’s how I know I’m overdoing it. Still, it’s a fab idea to substitute water for coffee, tea or juice. I’m definitely going to give this a shot. I’m an avid cyclist, and I drink a lot of water while on my bike. However, when I’m not riding, it’s usually coffee, tea, and, occasionally, chocolate milk! I’m in! I don’t struggle much with this, but it never hurts to have a little motivation. I invited all of the Tulsa Oklahoma moms who read my blog to join Project Hydrate too!! Thanks for all your great inspiration, Diana!! Thanks so much Kristen!! 🙂 And, you’re welcome! I need to do this. Thank you for the push. We make an iPhone app called Waterlogged (http://bit.ly/9uODZr) that helps people track their water intake. I’ll donate up to 40 promo codes for you to give away anyone that takes your challenge. Let’s help people finally drink the water they need to! Contact me and I’ll send them to you. I try and get my 8 glasses a day too, I keep pretty good track through logging it at http://www.myfitnesspal.com, and I think I might start to keep a better log on my blog. Do we get the logo on our blog showing we are participating? Ohh. I am in! I have been doing better about my water but can use a little push to remember it! I really wish I could give you some of my thirst – I drink 16 to 20 CUPS of water a day! I really wish I could cut it down but I have tried…I am addicted to water. It’s annoying, I have to tinkle like 20ish times a day, literally.